Traveling is a stressful process for anyone; but after navigating the city of Las Vegas upon flying in, I hoped to have a little time to unwind. I was relaxing to the sound of my guide dog, Jason, lapping up some fresh water when there was an unexpected knock at the door. I was oblivious as to any laws I had potentially broken. I opened the door to find a short, pale fellow, his badge glimmering as I attempted to center my blurred vision upon his face. 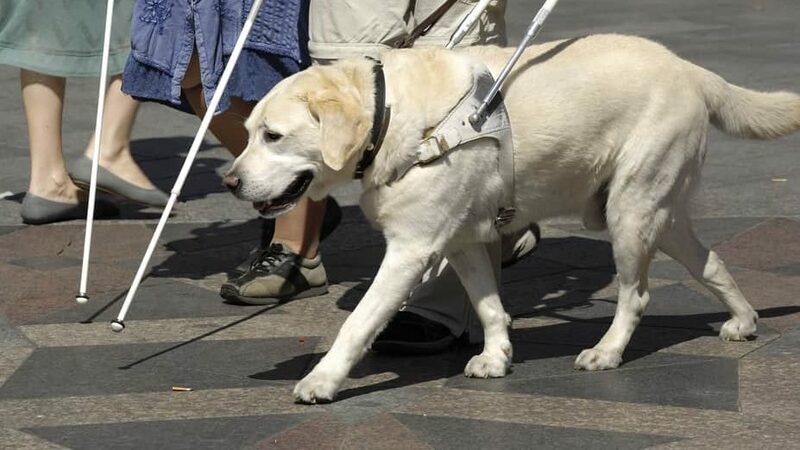 Having had Jason for nearly five years at that point, this certainly wasn’t my first experience having to advocate for me and my dog, but I never expected a police officer to violate state and federal law by asking for my identification from Guide Dogs for the Blind. Unfortunately, I didn’t stand up for us, explaining my rights to him only after providing the identification from my wallet. I have been through far more trying times since becoming legally blind. I have been denied rides from taxis and Uber because I have service animal. I have been given smaller bills than I should when receiving change from servers and cab drivers, not realizing it until I counted my money later, after people had already taken advantage of me. I have been robbed at San Francisco’s Balboa Park BART Station, with some crook having run off with my backpack containing all my adaptive equipment. I have been denied shopping assistance at the grocery store, had strangers question the legitimacy my disability, and had professors ignore my needs for reasonable accommodations to complete a course’s curriculum. In all of these cases, I have advocated for myself, either by seeking guidance from my instructors and support network, educating an ignorant stranger, or taking legal recourse. But this time, when the police officer came knocking, I failed. In reflecting upon my experiences, I am reminded that in most cases, no one will stand up for the disability community if we don’t stand up for ourselves. And when confronted with these scenarios, it’s important to be informed and ready to share information. This is why I’m glad the National Association of Guide Dog Users (NAGDU) has developed a free application for smartphone users, which details pertinent bylaws from the Americans with Disabilities Act concerning service dogs, laws that ensure the rights of service dog users in all fifty states, and specific guidance for industries of particular concern to service dog handlers, such as restaurants, hotels, taxicabs, and healthcare facilities. The app also provides users the ability to connect directly with the NAGDU Information & Advocacy Hotline, as well as send an email for more information. By sharing knowledge and tools for advocacy among the disability community, we not only educate each other, but also we strengthen our resolve. The next time I am denied equal access or harassed due to the presence of my dog, I will smile, explain my rights, and show them the text from the pertinent federal and state regulations that protect our ability to travel anywhere freely on my phone. The best way to wage war against discrimination is to arm oneself with information. Brett DeSalvo is an undergrad student at Cal State Fullerton majoring in Cinema & Television Arts. He is in his third year hosting the weekly sports/general talk show entitled "Blurred Lines w/Legally Blind Brett" for the University's Titan Internet Radio. You can listen to his provocative insights every Wednesday at 2 PM (Pacific) at titanradio.org. While not studying, he devotes his time to his true passions: sports, movies, and stand-up comedy. Follow Brett on Twitter: @lbbrett or message him on Facebook: facebook.com/brett.desalvo.